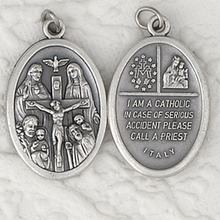 "Fine crafted oxidized silver, imported from Italy, measure 1"" high and about 3/4"" across. Finely detailed, lowest price on the net. Patronage adopted children, diocese of Arlington, Virginia, civil servants, court clerks, difficult marriages, large families, lawyers, diocese of Pensacola-Tallahassee Florida, politicians, politicos, statesmen, step-parents, widowers"